The theme for this butterfly challenge is 'Y for You Choose and/or Wedgewood Blue'. I've chosen to use a stamp from way back and have coloured the butterfly in two shades of blue which are sort of the right colour. 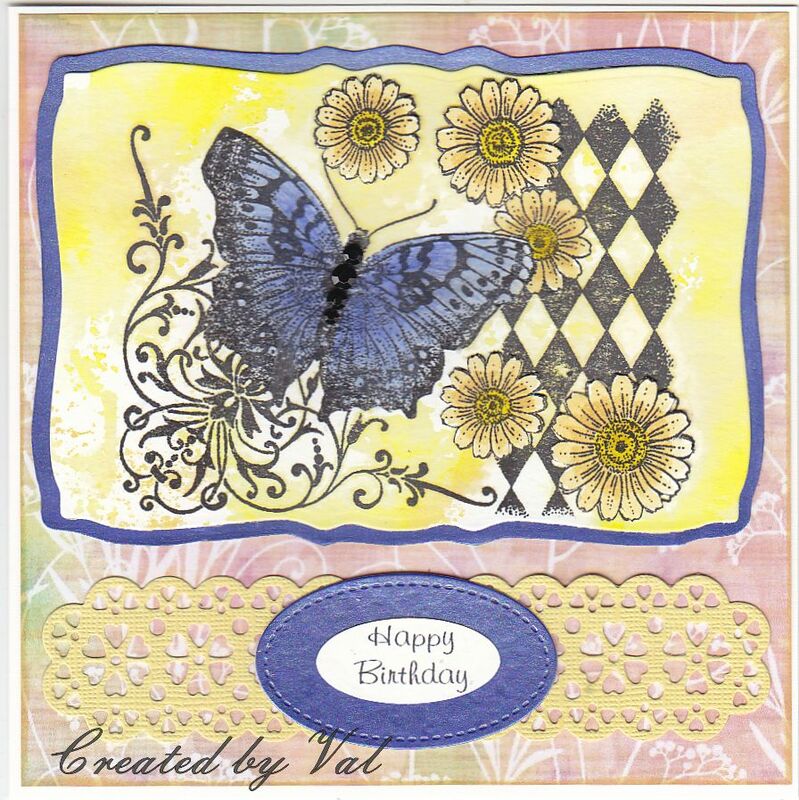 After stamping I masked off the butterfly and one of the smaller flowers before applying two different yellow Distress inks to an acrylic block and spritzing with water and pressed it over the image. I then removed the mask and coloured the butterfly with pencils. Another image was stamped so that most of the flowers could be coloured (using Distress markers) and cut out carefully with scissors to pop on top of the image for a bit of dimension. Gems were added to the butterfly body. The image was die cut and layered onto a blue background; a yellow lacy border was die cut from a scrap of card and a computer sentiment punched out and popped onto a die cut oval. There is plenty of time for you to enter this challenge because it is going for longer due to school holidays. 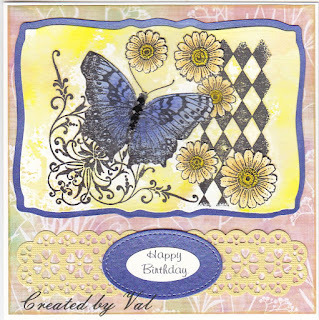 Such a beautiful card Val, it so nice to see a stamp from way back. I love the colours they go so well together. This is beautiful. I love the butterflies colouring. These are the colours I have in my hallway and they go so well together. Thank you for fluttering into the butterfly challenge. Hugs Mrs A.